76% of customers say this fits as expected. This is the third pair of winter house shoes I have bought, and have finally found my perfect pair! They are just perfect and so soft and cushiony i love them! These fit well, but I do not feel that they are as well made as some slippers that I have bought. 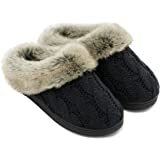 ULTRA-SOFT WOOL-LIKE PLUSH FLEECE LINING: It is easy slip-on design slippers, along with high-quality and comfort man-made fluffy plush fleece lining that encompasses your feet very well and offers soothing comfort. 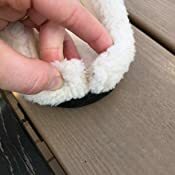 DURABLE & ANTI-SKID RUBBER SOLE: The light-weight and durable rubber sole makes the fuzzy knitted slippers perfect for indoor and outdoor family use. Anti-slip outsole allows for stepping noiselessly in the bedroom. Each of your steps will become steadier with slip-resistant texture on the bottom. 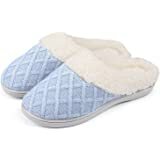 HIGH-DENSITY MEMORY FOAM INSOLE: The stylish fuzzy knitted no back slippers is lined with high-density memory foam that really molds to your feet and retains the shape. 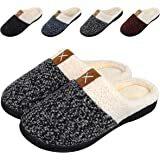 STYLES & COLOR OPTIONS: This flat style slipper is also designed for men with different color. Just click our brand name and enter into the store to get a pair for your loved ones. Available in Women's choice of Black & Wine. 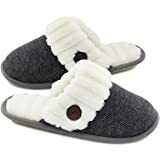 Constructed with wool-like plush upper and high density cushioning, these slippers may feel a bit snug at first and then they will stretch a little to a customized fit after several wearing. 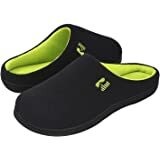 ULTRAIDEAS Comfort Memory Foam Slippers - Refreshing Your Daily Life! When you get home after a long day, all you want to do is kick back and relax. But once you kick off your shoes, walking around barefoot on your hard floors isn't really doing your tired feet any favors. 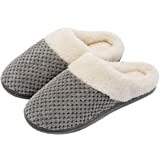 Show your feet a little love by giving them a pair of soft and cozy slippers to slide into. 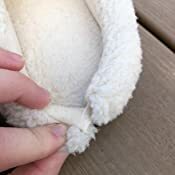 You'll love the feeling of the soft wool-like plush fleece lining, and the high-density foam base will have you feeling like you're walking around on clouds. Grab a pair today and give those hard-working tootsies a break. 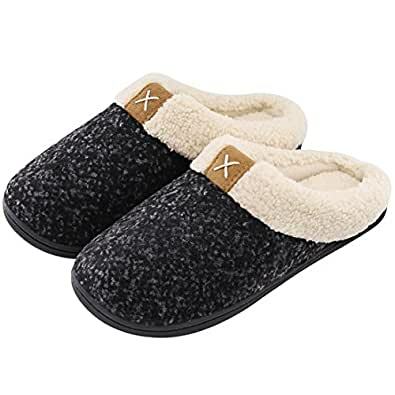 The soft and high-quality wool-like plush fleece lining can perfectly adapt to your feet. It is more comfortable and soft to wear than traditional slippers. Machine or hand washable, easy to care, ultra soothing comfort. The slippers are also designed for men with different color. Just click our brand name and enter into the store to get a pair for your loved ones. 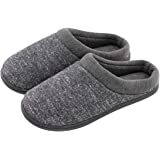 Men could also try these soft slippers to buy one size bigger than the normally wearing shoe size. Treat your feet and grab a pair today! - RISK FREE - Click ‘Add to Cart’ above to get yours now! These slippers are super comfortable and just what I needed for the cold months. I am a 8-8.5 so I ordered the Medium, however it would of been better if I ordered the large (9-10). The Medium fits ok but pretty snug. Order up if you're a halfsize gal like myself. Other than that these slippers are awesome. Due to the rubber soles, you can wear them inside and outside. Definitely recommend. These slippers are cozy and yummy! I wanted something warm, easy to slip on and with a sole I could wear outside. Glad I read reviews before purchasing so I knew they ran a little small (I wear an 8, but ordered the size designated for 9-10) ... the 7-8 MAY have worked but this size is just fine as is. Very happy with my choice ... and so are my feet! 5.0 out of 5 starsGreat slippers! I really love these cozy, cute slippers! 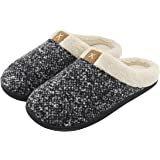 I read lots of slipper reviews before choosing these, and I'm glad I picked them. They feel really soft and warm on my feet, they stay on well, and they look nice. You might want to order the next size up if you're between sizes. I'm a 9.5 or 10 and I originally ordered these in a large, but I exchanged for the XL, and the fit is perfect now. The customer service for this was also excellent - super helpful and quick. 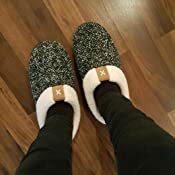 If you need slippers, I highly recommend these! (Tobias’s wife here) I love these! I was a little concerned when I first ordered them, and seeing how so many people stated to go a size up AFTER I ordered them.. But I went with my gut instinct and got the 7/8 (I wear a 7.5) When I received them they did fit a little “small” (back of heel popping out) however after a couple of days of breaking them in, they fit perfect! They are memory foam, so you have to wear them down a little and let them conform to you. I wouldn’t necessarily say to go a “size up” like everybody else is saying. You just gotta break them in! Very comfy though, and highly recommend! 3.0 out of 5 starsBuy a bigger size, as they run too small. They are cute and comfy, but they run too small. I'm a size 11, the 11/12 doesn't fit. I just noticed that others mentioned this.. so if you wear a size 10 for example you probably need the 11/12. Size 11? skip these slippers. 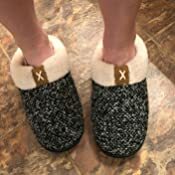 I was a little skeptical about these because I'm not a big slipper person-I prefer socks, but my new apartment floor is just too cold for socks alone. I shouldn't have worried, this are SO warm and very comfortable. I have size 9.5 feet, so these were a little bit small at first because the inner part hadn't been worn in yet-I think it will be fine as I continue to wear them. And I do wear them with socks. Overall I love these and I'm really glad I purchased! 5.0 out of 5 starsSlippers Arrived B-4 Expected Shipping Date! LOVE these slippers! They are so soft and comfortable. I agree with those who suggest that you buy your pair one size larger than what you normally purchase. Doing that keeps your slippers very roomy inside and keeps your heels away from hanging off of the back ridge. They feel safe on my feet and are very warm. They wash well too! They were packaged well and actually arrived BEFORE my expected shipping date! Oh my goodness. These slippers are so incredibly comfortable. I ordered a size up like other reviewers said and they fit perfectly. I typically wear a size 9.5 and I ordered an XL (11/12) and they have a bit of room on the back so my heel isn’t hanging off. I’m in love with these! !